We all love having a shiny, healthy smile. Being able to confidently flash your shining ivories can prove to boost your self esteem. Optimal oral health is also beneficial for total body health, as more evidence has come forth that establishes a link between poor dental hygiene and a myriad of health concerns. It’s important for you and your family to take care of smiles. If it has been awhile since your last check up, our family dentists advise coming in for a dental exam. Concord Smile is proud to be your local dentists in California, delivering a high level of care to match our relaxed and friendly staff. We specialize in cosmetic, restorative, and general dentistry in Concord, delivering amazing results that are sure to make you smile. While we strive to deliver the highest level of care, our board-certified dentists cannot assist you on a daily basis. Today, we’ll continue to highlight a few tips that may prove helpful in keeping your family’s oral health at an all-time high. When done, be sure to contact us to schedule your appointment. While replacing sugary drinks, we recommend introducing a variety of healthy fruits and vegetables to boost your immune system and reduce the amount of sugar impacting your teeth. Our modern-day diet consists of high levels of sugar and corn syrup, dangerous substances that can cause aggressive tooth decay and lead to cavities. Be sure to introduce more healthy elements into your family’s diet. Doing so will definitely help you in retaining a white smile, but can provide a range of other benefits for the rest of your body. Modern studies have revealed that flossing may be just as important if not more important than brushing. Throughout the course of a normal day, your diet will introduce a range of harmful bacteria that can attach to your teeth, normally thriving within the gum line. If left unhindered, this bacteria can grow and turn into tartar, a calcified deposit that forms on your teeth and contributes to faster tooth decay. It’s recommended to floss daily to remove these tartar-causing elements. Doing so will help you in your quest to avoid tooth decay and tooth loss. Beyond healthy dieting, avoiding sugary drinks, and flossing regularly, there are many other avenues that can provide better oral health for your family. One of the best ways to keep your smile healthy is to visit your local dentist on an annual basis. Routine dental exams and oral cleanings are the building blocks for long-term oral health, as doing so works to prevent the advance of tooth decay and gum disease. Our experienced dentists are trained to inspect your smile to look for any underlying problems, creating personalized care plans to create a healthy environment for your gums and teeth. 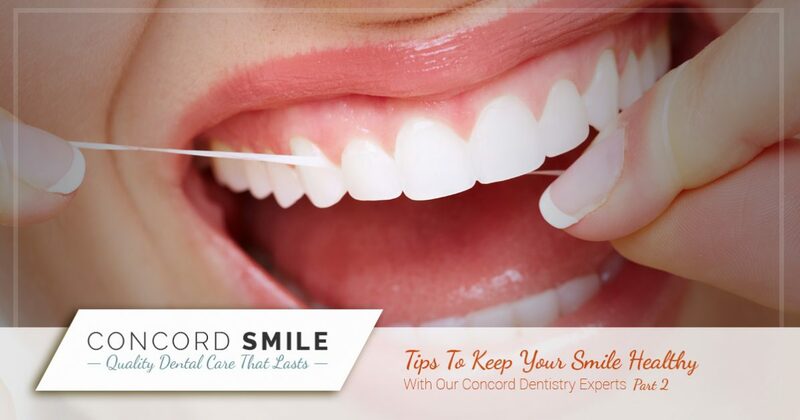 Concord Smile is here to serve as your lifelong family dentist. Our specialized and general dentistry services in Concord are tailored to deliver the most productive and cost-effective outcomes for your health needs. We offer a full range of specialties to comprehensively care for your smile. Contact us today to learn more about our Top Rated Local® dental services or to schedule your appointment!